Google Chrome 62 has been released in the stable channel for Windows Desktops, Mac, and Linux platforms on 17th October 2017. The Google developers have added new and improved features in Chrome 62 and fix several security issues. The highlighted new features include OpenType variable Font, capture media stream, more useful network information APIs, and a few more. The few of the changes in Chrome 62 for developers are also included. Chrome 62 continues to encourage HTTPS adoption for web pages. In Mac OS, the Chrome buttons match with the OS to give some new look. Let’s see the complete list of new features and improvements for Chrome 62, and then you may update your Chrome browser to the latest stable version to experience and explore the new interesting features of Chrome 62. Chrome 62 makes the network information API more useful by providing real performance metrics instead of theoretical results. It has support for OpenType variable fonts. You can now live-capture content into a MediaStream directly from HTMLMediaElementslike audio and video, with the Media Capture from DOM Elements API. In Chrome 62, the Payment Request API is now available for iOS. When a user enters data on an HTTP page, Chrome will mark the page as “Not Secure” with a label in the address bar. This label will also be shown in Incognito Mode for all HTTP pages in Chrome 62. 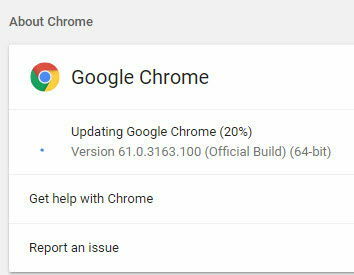 Following issues have been fixed in Chrome 62 which were reported by users. UXSS with MHTML issue has been fixed. Heap overflow in Skia, in libxml2, and in WebGL has been fixed. Use after free in PDFium and in WebAudio. Incorrect stack manipulation in WebAssembly. Out of bounds write in Skia. Incorrect registry key handling in PlatformIntegration. URL spoofing in extensions UI. Null pointer dereference in ImageCapture. If you are already a Chrome user and using Chrome 61, then your browser needs an update. You don’t need to uninstall your browser to get the latest update. You may simply get the latest update via Chrome Update. Proceed with below steps. 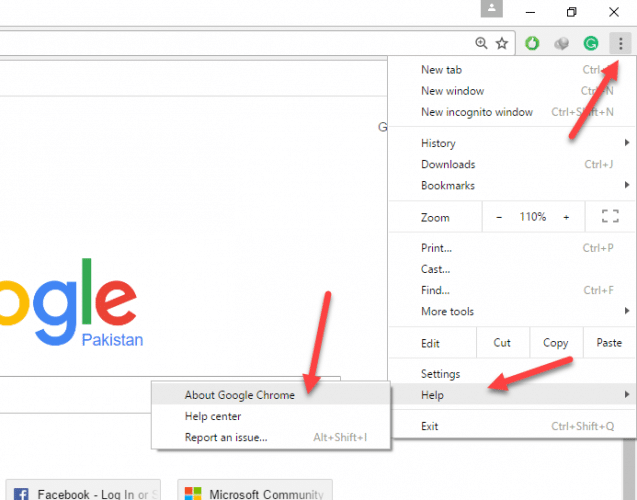 Open Chrome browser and Go to “About Chrome” from “Help” option available in the Menu of Google Chrome. If an update is available, it will start downloading that update for you. When the update will completely install. Relaunch Chrome once, and again go to “About Chrome”, and now you will have a message that says your Chrome is updated one. After downloading and installing the Google Chrome, you can easily check that you have successfully installed the latest version of it. Go to the vertical dots menu and then select the “Help” and then “About Google Chrome”. Now it will show you the information about your browser version. And also gives you a message that your browser is updated. And will also tell you if any new update is available. Find the Offline Installer link for your Operating System and download it. And then complete your installation without Internet connectivity. It is always recommended to use the latest version of an app when it is available. Thank you.